How Does Anxiety Increase the Risk of Dementia? Statistics suggest that up to 15 percent of older adults experience anxiety disorder. The condition is also often displayed in seniors diagnosed as having cognitive impairment secondary to various types of dementia. To better understand a possible correlation between the two disease processes, researchers from around the world performed a variety of studies. They learned that because anxiety causes different negative effects on the brain, seniors affected by anxiety have an increased risk of dementia. Psychiatric researchers from Brigham and Women’s Hospital in Boston published their study in The American Journal of Psychiatry. The research involved following 270 seniors over five years. When the study began, all of the participants had normal cognitive health but demonstrated symptoms of anxiety, depression, or general sadness. The participants underwent PET scans and were evaluated according to the Geriatric Depression Scale. As the study progressed, the team learned that the more severe the anxiety symptoms became, the greater the amount of beta-amyloid proteins developed in the brain. Over time, the proteins adhere to one another and form clumps, which causes neurons to tangle in the process. The disarray of cells interrupts normal communication and eventually causes neuron death. The loss of healthy neuron function can have both emotional and physical effects, making it challenging for seniors to remain healthy on their own. If your senior loved one has been diagnosed with a serious condition and needs help with tasks like meal prep, transportation, bathing, and grooming, reach out to Home Care Assistance, a leading provider of in-home care Huntsville, AL, families can trust. We also offer comprehensive care for seniors with dementia, Alzheimer’s, and Parkinson’s. For 28 years, researchers from the Swedish Adoption/Twin Study of Aging worked with California scientists from USC and evaluated 1,082 participants who were fraternal or identical twins. Every three years, the volunteers completed questionnaires and underwent imaging studies to monitor for possible symptoms of dementia. The scientists understood that individuals experiencing high levels of anxiety commonly have higher levels of cortisol and other stress hormones. Abnormal cortisol levels damage neurons in the amygdala and in the hippocampus, where the brain stores memories. The hormone also affects the frontal cortex, where problem-solving and other higher levels of thinking take place. During the study, the researchers learned that among fraternal twins, one sibling was more likely to develop dementia. The same was not true for identical twins. The scientists concluded that in addition to anxiety, there may also be unknown genetic factors that contribute to the risk of developing dementia. The scientists explained that the individuals eventually affected by dementia tended to have high levels of anxiety. 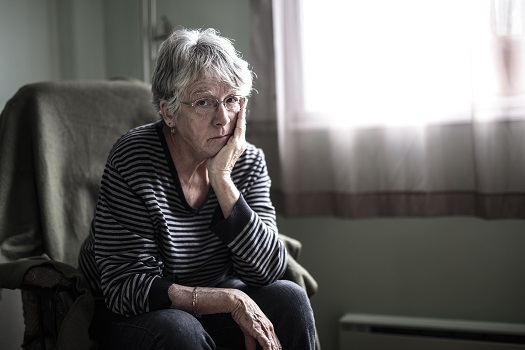 The seniors demonstrated ongoing nervousness and were described as being “frantic and frazzled.” The study revealed that older adults with higher levels of anxiety had a 150 percent increased risk of developing cognitive impairment. The research team hopes to continue its studies to determine if individuals being diagnosed and treated earlier for anxiety might lessen the risk of dementia. If your loved one has anxiety and/or dementia, you may want to consider hiring a professional caregiver to help. Certain age-related conditions can make it more challenging for seniors to age in place safely and comfortably, but Huntsville live-in care experts are available around the clock to help seniors manage their health. Whether your loved one is living with dementia or is recovering from a stroke, you can trust the professional live-in caregivers from Home Care Assistance to enhance his or her quality of life. If you have a loved one with dementia, seeing him or her experience anxiety could cause a great deal of stress for you as well. Even when families have the best intentions, caring for a senior loved one with dementia can be challenging. Fortunately, Home Care Assistance is here to help. We are a leading provider of dementia care. Huntsville families can take advantage of our flexible and customizable care plans, and our caregivers always stay up to date on the latest developments in senior care. Reach out to us at Home Care Assistance if you need compassionate, professional care for your loved one. Call one of our dedicated Care Managers today at (256) 716-9940 to learn about the high quality of our in-home dementia care services.